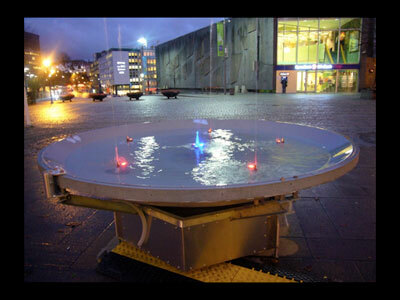 The Electromagnetic Fountain will stand in Porsgrunn, Norway, for a period of nine days during the annual national research days. 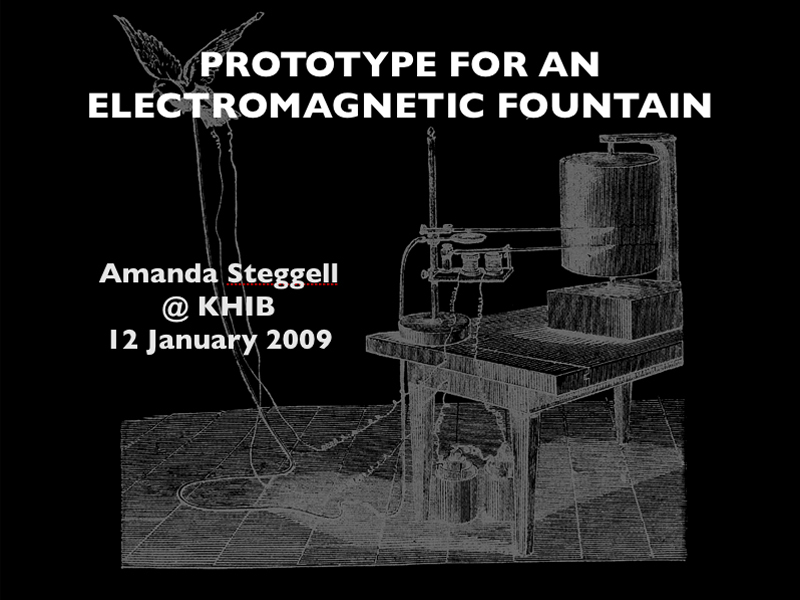 Here are my notes and slides of a presentation of the Electromagnetic Fountain that I gave at the National Academy of the Arts in Bergen on Jan 12th 2009. It is a bit of a new approach to presenting this project, and revolves around some autobiographical reflections and associative imagery that has emerged through the process of working with the fountain. 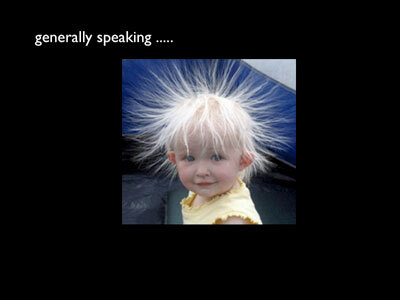 With only 20 minutes for my presentation, I try to show more and talk less! During the mid 1990’s I became involved in exploring the potentials of the net, or the information super highway as it was often referred to then …..
…… as a creative platform for artistic exchange. I collaborated remotely with artists from several continents via the new audio/video transmission and tele-conferencing systems to create performances, installations and social, live art happenings. 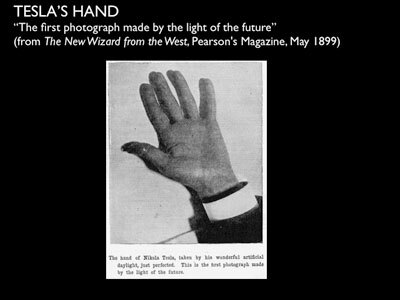 One of the rituals of participating in this telematic space was to perform a compulsory “good bye” wave of the hand into the webcam to each other when closing a performance. [ Slide: MIRAGE. 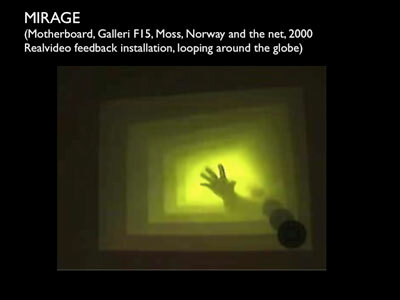 Motherboard, Galleri F15, Moss, Norway and the net, 2000. 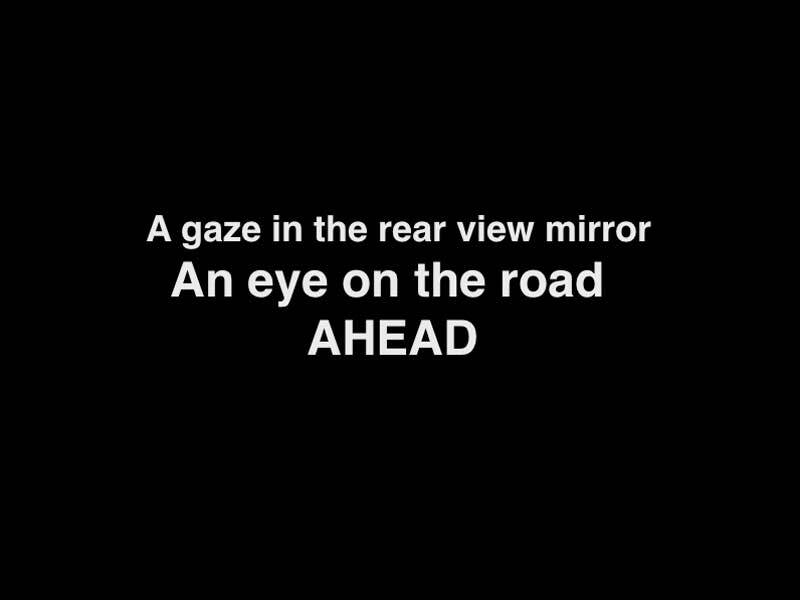 This created a simple form of non-verbal communication that could generally be recognised despite the low bandwidth crackly audio and pixelating video transmission. 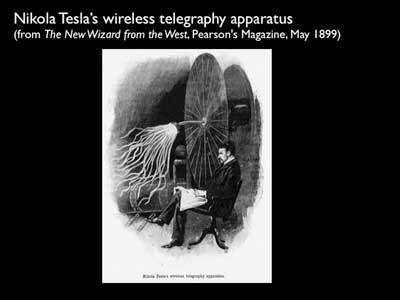 Today I am interested in exploring the potential of another kind of wave as a source of artistic material, namely the electromagnetic waves and pulses that are emitted from our numerous electric, wireless and mobile communications devices. They pass through our streets, homes and bodies and increasingly carry the raw signals of our wireless communications, and yet they are, generally speaking, imperceptible to humans without some kind of technological intervention. 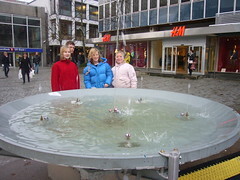 I am attempting to reveal them and give them a physical presence in the form a fountain whose water jets and coloured lights dance to the electromagnetic activity detected in its near vicinity. 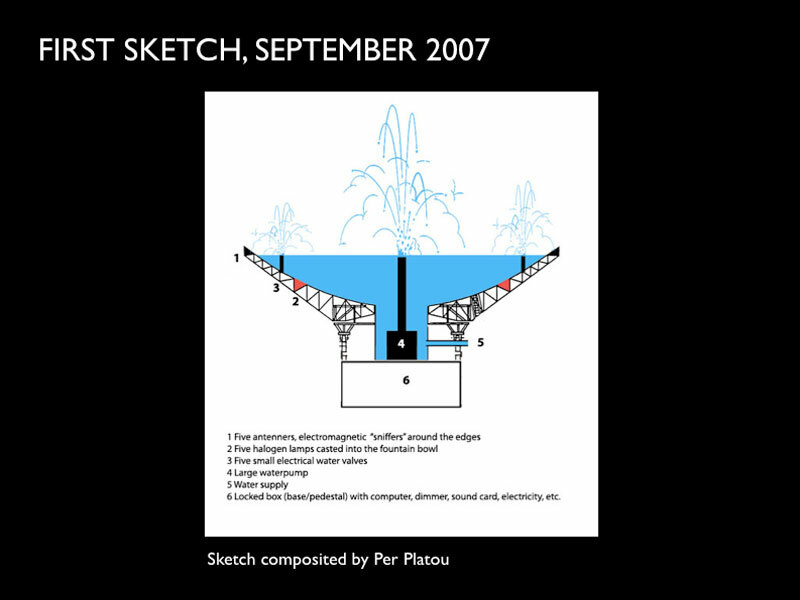 The fountain was conceived as a portable fountain with performance value, designed to appear in urban spaces where there are “hot spots” of electromagnetic activity for a short period of time before moving on to a new destination. Its bowl is a recycled, redundant parabola antenna dish acquired from the 120 m high television transmission tower on the hills of Oslo (from which Stockholm can be seen with the bare eye from an observation tower when the weather permits). It has become redundant because analog TV transmissions have recently been terminated in favor of digital signals, and the previously designated bandwidths are being sold off to the highest bidder. The electromagnetic spectrum, in its entirety, has increasingly become “a hotly fought over political, commercial and private territory” (E. Berger and M. Howse, 2007). Sometimes it is hard to remember that the air that we breathe has become colonised by the wild-fire of WI-FI, and the environmental and health risks involved are not yet fully understood. This is reflected by the attempts of corporate network providers to hide their transmission and reception devices from public view with the aim of reducing the fear that the lack of adequate information surrounding these issues inspires. Take this palm tree for example. 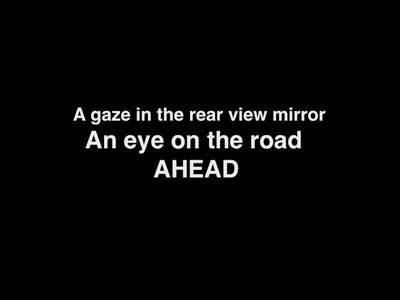 I spotted it while driving to the airport in Rome in 2007. And yet fear is an issue that I deal with each time my cell phone runs out of power, or I forget it. I just don’t feel safe without it. I seldom switch it off, though I often want to. As I feel my ear starting to get warmer, I can’t help wondering whether my brain is getting cooked as well. …. 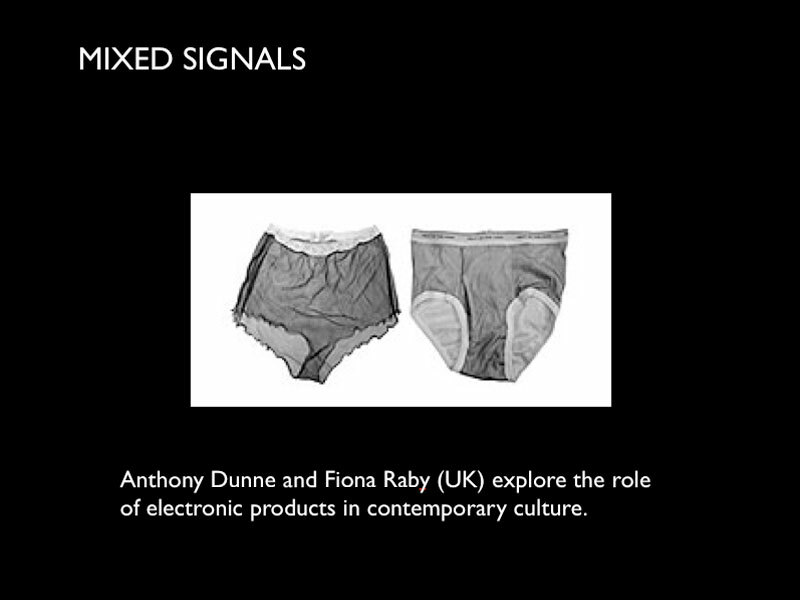 placebo underwear with silver lining to protect your nether regions from electromagnetic radiation, created by the dynamic duo, Dunne and Raby (UK). Science is a social activity that we perform in our everyday lives – winning on the roundabouts and losing on the swings. It is a risky business. The question arises as to how much (and with what) we are prepared to pay in the pursuit of high speed, physical and telematic mobility that are a part of modern day life. Life seems so fast these days. There is a pressure to always be available at different places at the same time, yet in different time zones – or going somewhere without actually moving from the spot. Sometimes I wish to slow down time for a while, and experience the world from the earth up, rather than the sky down (as I do when I pear down onto my keyboard and into the deep space of my horizon-less screen). I want to know how things work, under the veil, so to speak. 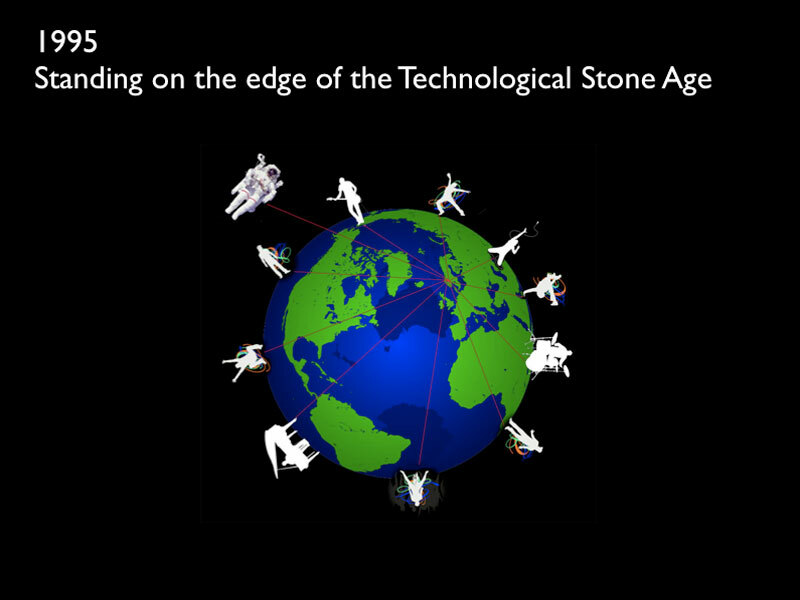 I want to look beyond the ease of the slick point-and-click interface to explore the raw signals of telematic communications – to catch them before they pop out of a screen or speaker. Before they become a cell phone conversation or an sms, a surveillance image on a video screen, an email, a bank transaction, a death match in Unreal Tournament 3 or a new avatar in Second Life. I want to give them a body that can only be experienced locally, yet is made up of a myriad of local and global gestures and utterances, and a multitude of physical bodies. Big aims for a little person! Marshal McLuhan once noted that electricity is itself a medium with a message. 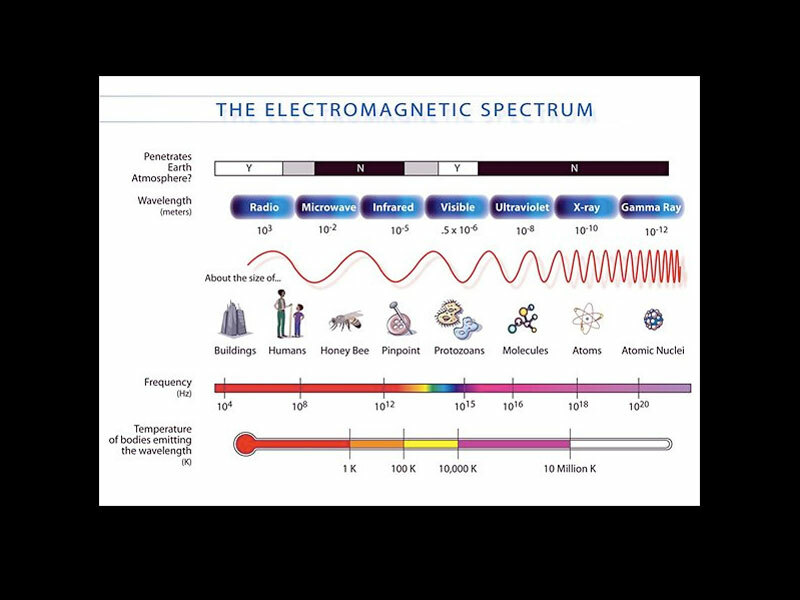 With my current work I suggest that, more specifically, it is the electromagnetic spectrum that is a medium worth paying attention to today. But how can you pay attention to parts of the spectrum that humans cannot see, hear, feel, taste or smell? 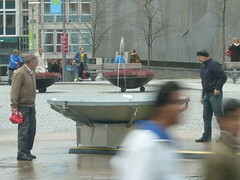 In the case of the fountain, it is equipped with an electromagnetic detector, or “sniffer”. …. it picks electromagnetic transmissions and transforms them into audible signals, drawing them down to one point on earth and grasping the feeling of the analog waves and digital pulses as they pass by. 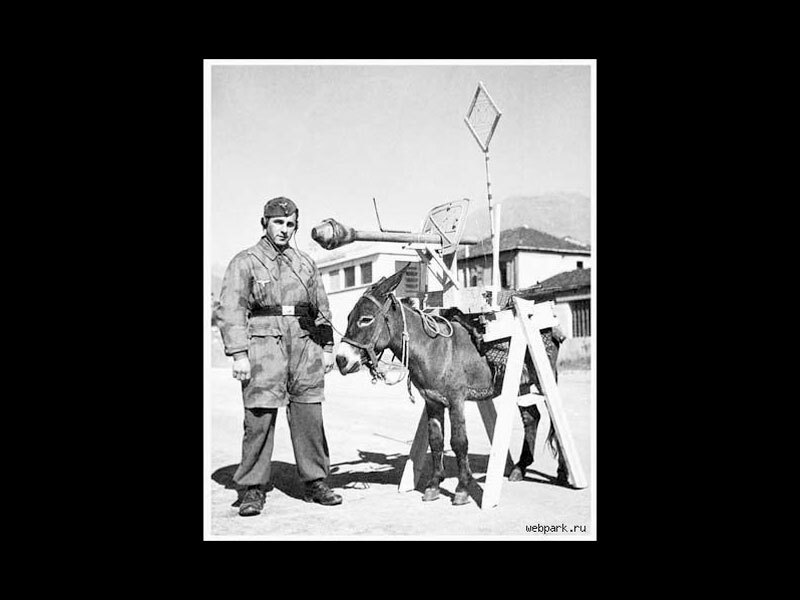 Let me give you an example – the sound of a a laptop with a wireless router performing a bit torrent download, recorded by Martin Howse using a sniffer he made for the fountain. 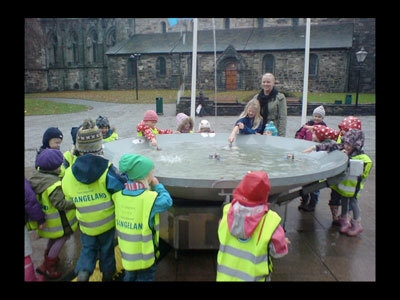 It is the qualities of the screaming, popping and crackling sounds that the fountain uses to control its water pumps, valves and lights. 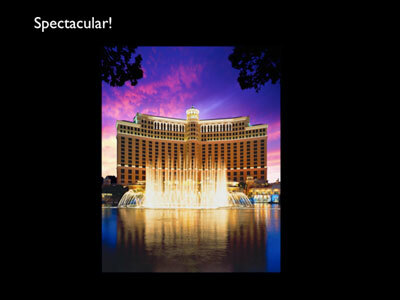 In other words, it functions like a musical fountain – a famous example of which is the Bellagio fountain in Las Vegas. 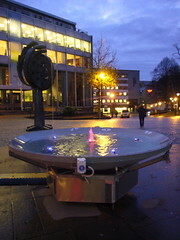 Fountains generally perform aesthetic functions. 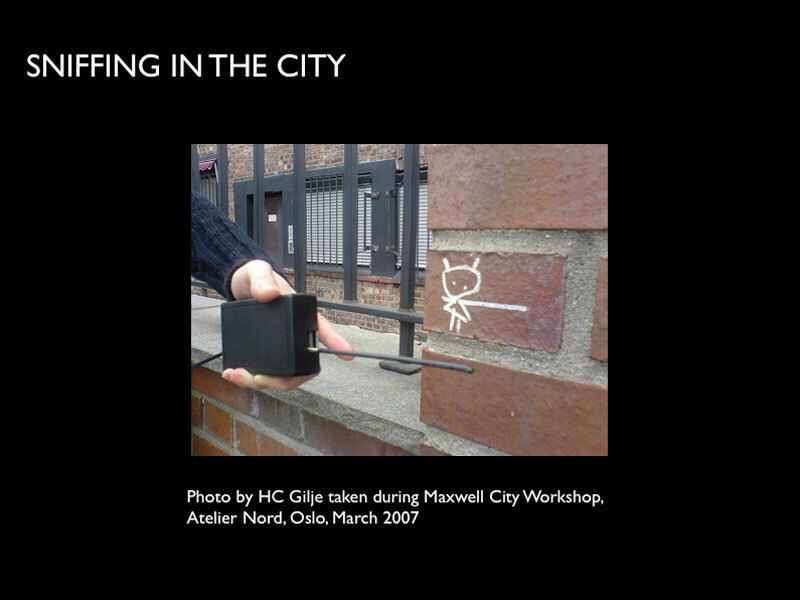 When placed in urban spaces the intention is often to bring an oasis – an experience of nature, into the city. The Bellagio fountain, though easier to describe in terms of entertainment than nature, fits naturally into the virtual reality of Vegas. Yet it contributes to sucking dry a valuable natural resource – water. On the surface, what is natural in one sense seems unnatural in another, and yet the twain are unfathomably intertwined. 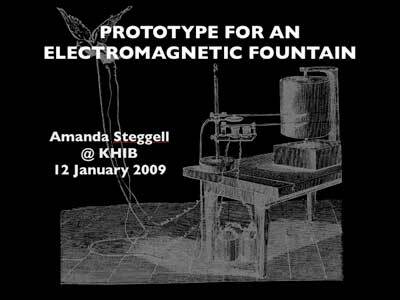 I do not wish for the Electromagnetic Fountain to fit naturally in with its environment, but I do wish it to establish a playful, aesthetic identity wherever it pops up. I wish it to misbehave a bit, to become an eye catcher, to create an emotive space, a gathering place, a form of information display – a data stream, wet to the hand and babbling with life – and perhaps even an electromagnetic barometer for those who encounter it. 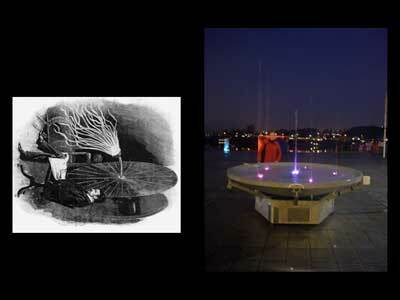 The Electromagnetic Fountain is “location sensitive” in more ways than one. 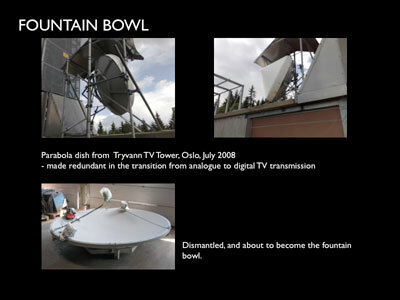 It is not connected to a water supply and therefore has to filled up with it, which it then recycles. Being placed outside and exposed to the elements has its consequences. A strong gust of wind sends the water flying out onto the street. Calling on the fire brigade to fill it up becomes a spectacle in itself – as was the case when it took part in the Article Biannual Exhibition of Electronic and Unstable Art in Stavanger last November. 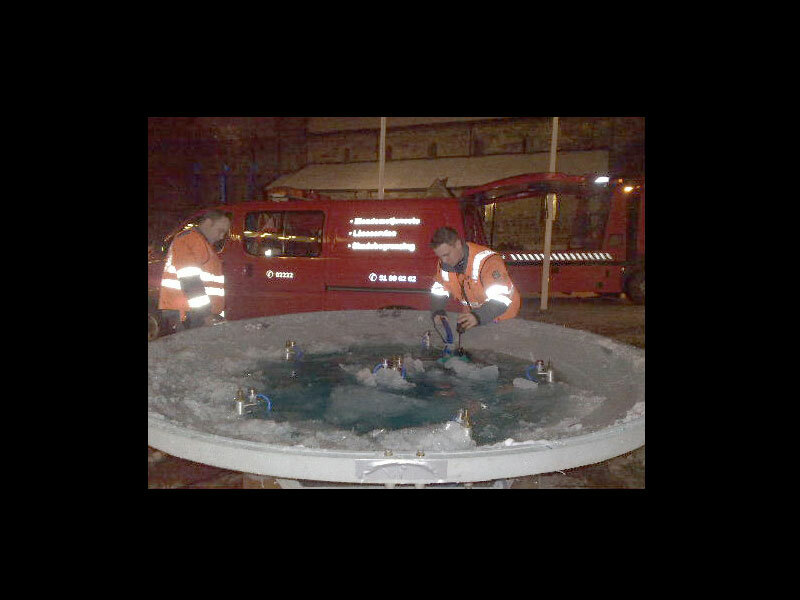 Getting them to rescue it when the temperature unexpectedly dropped below freezing point became another! 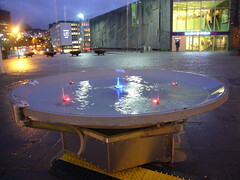 Here’s a 5 minute video of the fountain as it appeared on the town square in Stavanger. There are a few technological hurdles I wish to overcome before I’m through with the fountain. 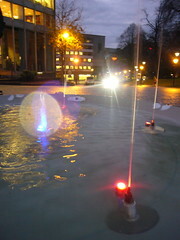 Shielding the sniffers from the fountain’s own electromagnetic emission is one thing I haven’t adequately achieved yet. It should be done to avoid creating a feedback loop that undermines its ability to detect and respond to other signals. Our physical bodies also emit a certain amount of natural, or bio electromagnetic radiation, but when we communicate wirelessly we emit more, and often unwittingly give up rights to bits and bytes of our ‘selves’ and our world in the process. This is my main concern – though it is the potential health risks that the press has focused on in their coverage of the fountain. Next time the fountain goes out into the world I intend to give it a speaker so that the noisy, crackly sounds of the electromagnetic detectors can be heard – though they might become too invasive to be tolerated in public space for long. I think troubled times demand a strong voice. By actively addressing both the positive and negative aspects of the coin, it may be possible to negotiate a radiant future in positive terms. That is, for what it is worth, my personal vision. How dangerous are electromagnetic fields? During the Article 08 exhibition I was assisted by Geir Tore Aamdal who works as an environmental health consultant in Stavanger. While watching the fountain, we had several conversations about how the health issues connected to the use of cell phones was the main issue that both the public and press referred to in connection with its appearance in the town square. 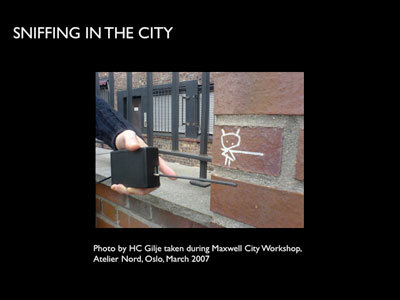 Lately there has been a lot of attention drawn to the electromagnetic fields in the urban landscapes. 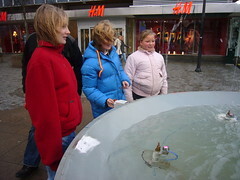 Stavanger municipality has been sued for allowing a network of wireless internet in the town centre, parents in Bekkefaret kindergarden demand that a mobile network antenna in the vincinity is removed, and environmentalist Kurt Oddekalv calls electromagnetic fields the largest threat to human health. But how dangerous are electromagnetic fields really? The knowlegde we have today about mobile phones and wireless networks shows no connection between these electromagnetic fields and health problems. But these are quite new phenomenons, with not enough experience yet. Many studies show no connection, some few indicate that there might be some connection. Just to be on the safe side, some measures for protection are recommended, like keeping the phone calls short, using handsfreegear, avoid placing the router in the bedroom, and avoid keeping the laptop in your lap. 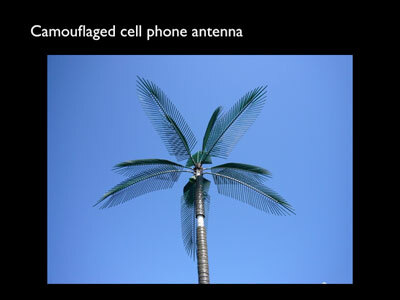 Antennas for mobile networks are sending the signals horizontally, which means that higher-than-normal radiation only is directly in front of the antenna. Higher values than international standards only occur within a range of 0,5 meter. 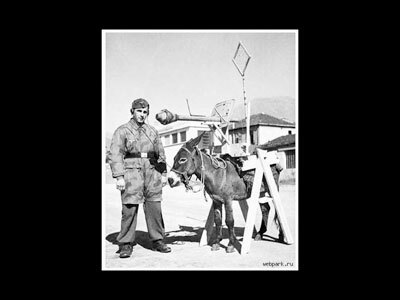 And the antennas usually do not send at maximum range. There is little information about young children using mobile phones, so caution is recommended. My advice to the worried public is to read only serious information on Internet, like the NRPA pages. And in planning new buildings, antennas and home networks having the recommendations from NRPA in mind, just to be on the safe side. When it comes to which is the largest health threath, for instance smoking and unhealty food are much more damaging , and the connection is well documented. Freezing electronic and unstable art! When discussing the installation of the Electromagnetic Fountain at Article 08, everyone seemed to agree that the temperature doesn’t fall below freezing point in Stavanger at this time of year. But it does! Last night I got a call from one of the Article 08 team to tell me that the water in the fountain bowl had frozen. Bad news. It can cause unrepairable damage to the pumps and valves. 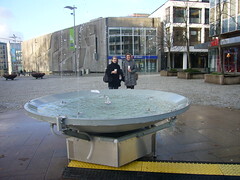 The only option is to remove the fountain from its place on the square before the exhibition ends. Though the fountain had to be taken into the warm a bit early, I think that it has played its part well. As far as the general public were concerned it had its own opening a week before the exhibition started while I was setting it up. I enjoyed seeing how the fountain changed the nature of an empty square, and turned a seemingly empty space into a gathering place for a short period of time. It was great to see people’s reactions to its presence – the curious, the observers, the playful, the mischievous, the young, the old, the sceptics, the enthusiasts, the impartial, the returners, the passers by, the early birds, the late nighters, the ones in the know – and especially the ones who explained to others what they understood the fountain to be, and how they thought it worked. 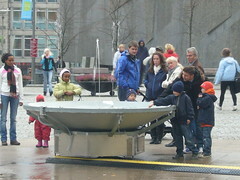 If things go to plan I’ll have the chance to work more on the EMF next spring before its next outing into public space. The experiences gained from Article 08 are an invaluable resource to take with me.